Glitter star trainers, fishnets and Leopard. Glitter star trainers, fishnet socks and a leopard print coat may not initially sound like a combination that will work and indeed, it might not be to everyone’s taste. But I love it. I mentioned in my previous post that after our Good Friday walk in Malham, Ian and I were starving, so we quickly changed out of our walking clothes and headed out for a late pub lunch. Well, lunch got even later because I decided that we should do an impromptu photoshoot en-route, such was my fondness for this thrown-together outfit. 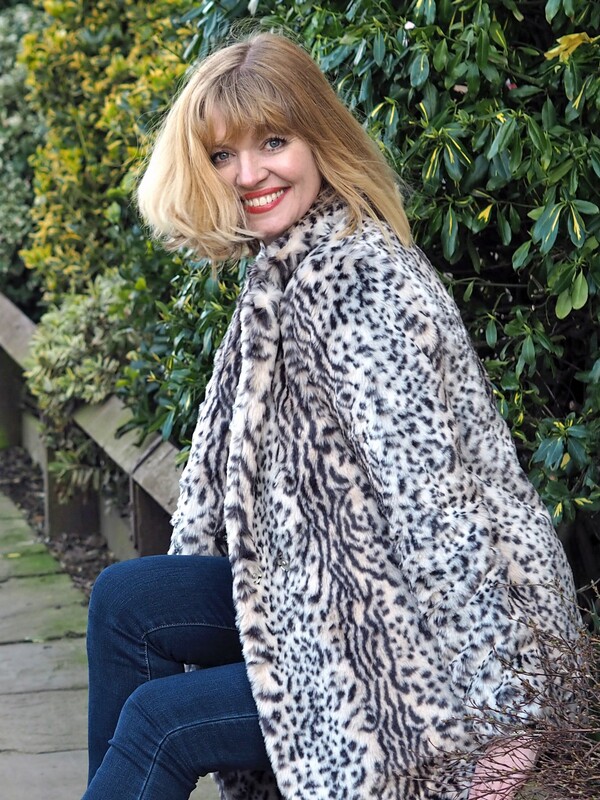 This is the leopard coat I got from Next just a week or so ago. It went into the sale and has sold out in most sizes. However, it’s worth checking back because things do get returned. 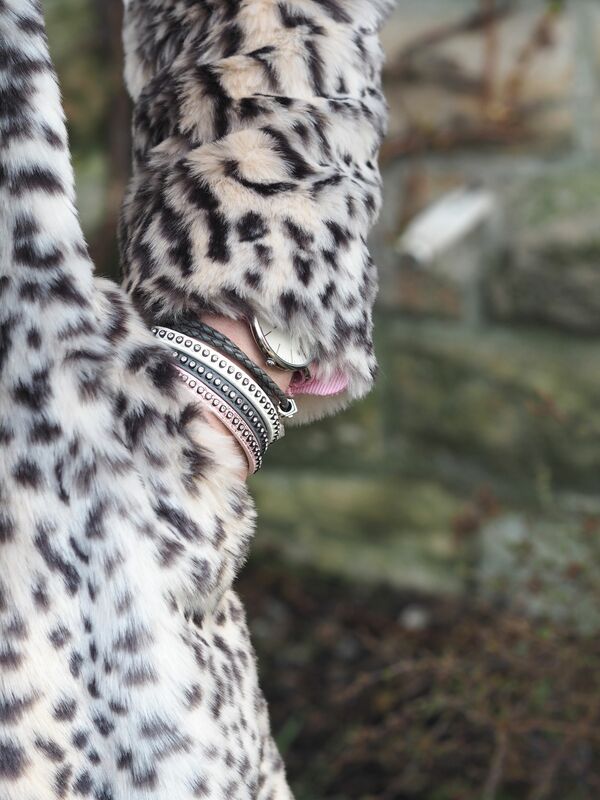 It’s a subtle leopard print, (if that isn’t an oxymoron). By that, I mean the tones are mellow with shades of grey and fawn, rather than tan, which can sometimes look a little harsh if worn in large doses. I’ve worn it every single day since I bought it and I honestly think I’ll keep it forever. It has (almost) made the recent Arctic weather bearable. My LOVE top was a gift from Baukjen last autumn. It’s one of those tops that’s neutral and easy to throw on, but one that’s much more than just a tee. 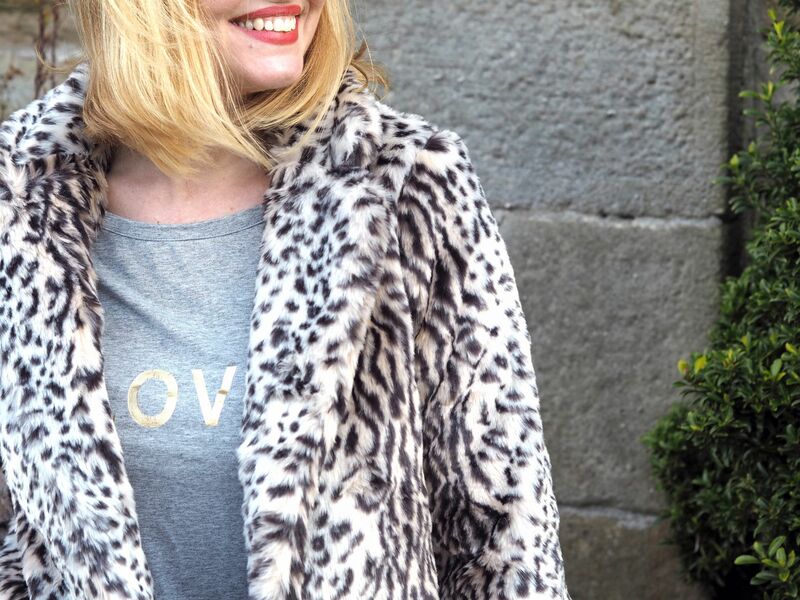 It’s sold out because it’s from last season, but there’s a similar one, with a “FOREVER” slogan that has equal appeal to me, although it’s a sweat rather than a tee And while we’re there, this Elizabeth heart breton, has my name on it. Perfect for this romantic stripe-lover. Until last year, the only trainers I owned were for the gym. I was VERY late to the trainers- as -part-of-an-outfit party. I’m not even sure if they should be called trainers. Pumps? Kicks? I’m just not cool enough to know. Anyway, these glitter star trainers are so pretty and I’ve been wearing them in place of ankle boots these last few weeks. Now I know there are a lot of designer versions out there, many of which I would love to have, but these at £35 from Next are a good alternative. 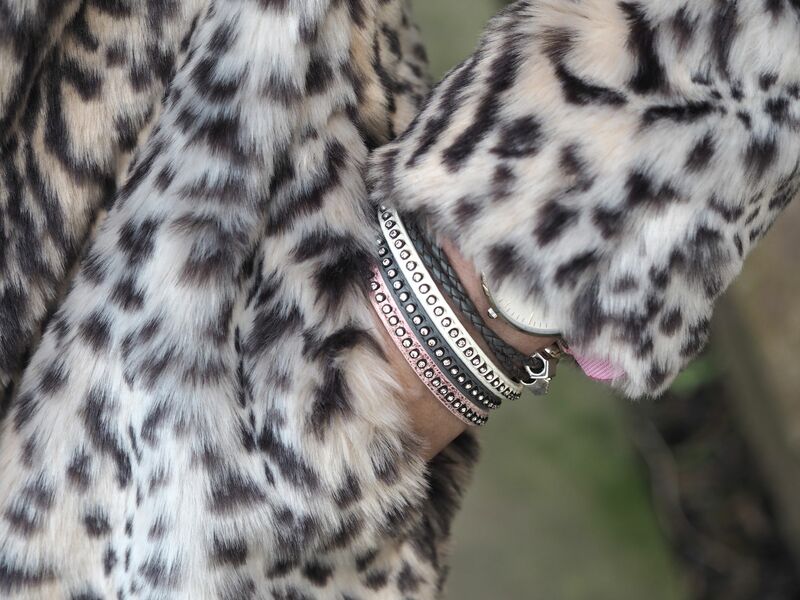 They come in several colourways too, including rose gold and leopard. Leopard!!! 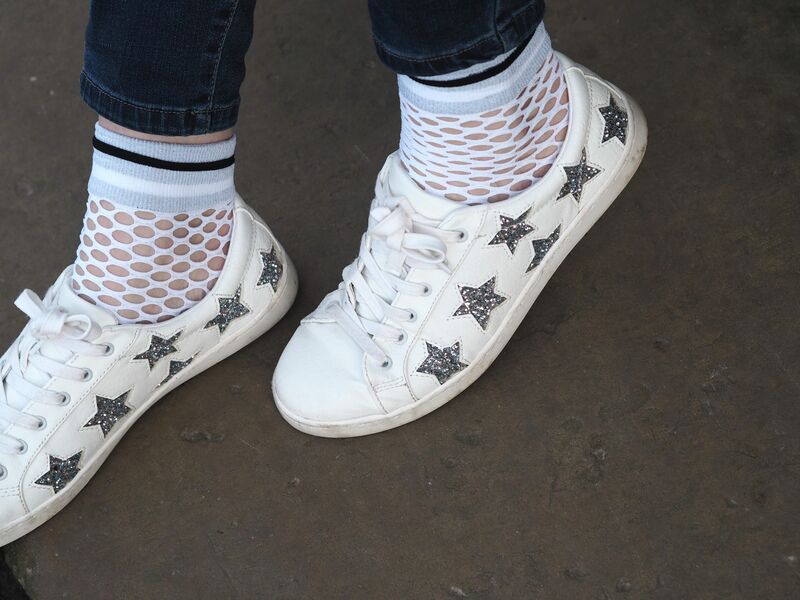 And how fabulous are these fishnet ankle socks? They’re from Topshop and are also available in black. I love layering up my jewellery and these diamante leather-look bracelets at just £7 each are an inexpensive way of adding sparkle and colour to any outfit. They have an even sparklier magnetic fastening. They’re from my own boutique and are particularly good in summer because they’re lightweight and comfortable. I’m wearing them with my grey leather Pandora bracelet and my Stefano Lungo watch, (which you can just see). So there we have it! An outfit that took minimum thought and one that can be recreated or modified very easily. I’ll be back in a day or two with the outfit I wore on Easter Sunday. I’m heading off tomorrow to stay with Ian for a few days and I absolutely can’t wait. Happy Friday! The Baujken Love top was a gift last season. All opinions are 100% honest and all content is my own. Thank you for supporting those brands that support my blog. Thank you, as always to Ian for his patience and willingness to take my photographs despite being starving! Previous Post Good Friday Walk in Malham, North Yorkshire. That’s a SENSATIONAL coat Lizzy. Gutted I didn’t see it on Next. The fishnets look great too!